If you are having some friends over for tea, your kids are having a tea party, or you're just looking for a new idea for an appetizer, what you're going to need are some tea sandwich recipes. Keep them small. Tea sandwiches are meant to be bite sized, so get some 1 - 1 1/2 inch round (or whatever shape you like) cutters. Keep it simple. Watercress or cucumber sandwiches are standard fair for a tea party and they are very easy to make. Keep it fresh. If you want to (or need to) make your tea sandwiches the day before your tea party, wrap them well with plastic wrap. Some sandwiches freeze well but bear in mind that once bread is frozen and thawed, it can go stale very quickly. Use a fine crumbed bread. Hearty rustic bread is a pleasure, but for your tea sandwich recipes you will want to use Pan de mie or Pullman bread. This kind of bread has a very fine crumb and will work best for your tea sandwiches. If you can't find Pullman bread, plain old sandwich bread will work just as well. If you can get an unsliced loaf of Pullman bread from your local baker, do so. Otherwise, see if you can find an unsliced loaf of sandwich bread. The reason we want an unsliced loaf is because we want the slices to be as thin as possible and we want to cut the loaf lengthwise rather than in regular sandwich sized slices. Why? Good question. Because cutting the bread lengthwise gives you more space to work with and will provide you with the most sandwiches with the least amount of wasted bread. But, having said this, if the only bread you can find is your standard sandwich bread, or if you just want to use the bread you have onhand, that's ok. If you can find an intact Pullman loaf, you will need a long thin bladed, serrated edge knife. Carefully trim off the crust and then slice very thin slices, about 1/4 inch thick. Try your very best to get an even number of slices. For the least amount of wasted bread, small square or triangle shaped sandwiches are best. For a more interesting platter, a couple of round sandwiches are a nice change. Chop the watercress, parsley, and chives very fine. Using your mixer, beat the cream cheese and butter until very smooth. Spread the filling over one side of the bread about ¼ inch thick. Either peel the cucumbers or score them by running the tines of a fork down the length of the cucumber. Using your mixer, beat the cream cheese until smooth. Add the garlic powder and celery salt to the cream cheese to taste. Spread the cream cheese thinly over the bread. Slice the cucumbers rather thinly about ¼ inch thick. 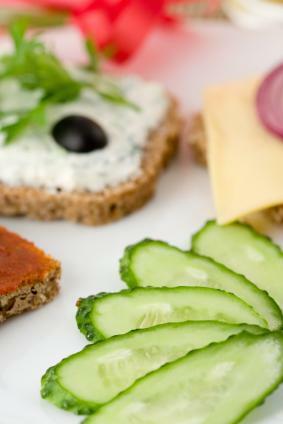 Place the slices of cucumber on the bread and place a small amount of the dill on the cucumber. Top with another slice of bread and cut into bite-sized sandwiches. Place the pineapple and sugar in a saucepan. Bring to a boil and, stirring constantly, cook until thick. Using your mixer, beat the cream cheese until soft and smooth. Add mayonnaise until the mixture is very smooth and spreadable. Spread on bread, top with another slice of bread, and cut into bite-sized sandwiches. To keep sandwiches moist, cover them with a damp paper towel before wrapping with plastic wrap. Cucumbers can make bread very soggy, so make the cucumber sandwiches as close to the time that you will serve them as possible.